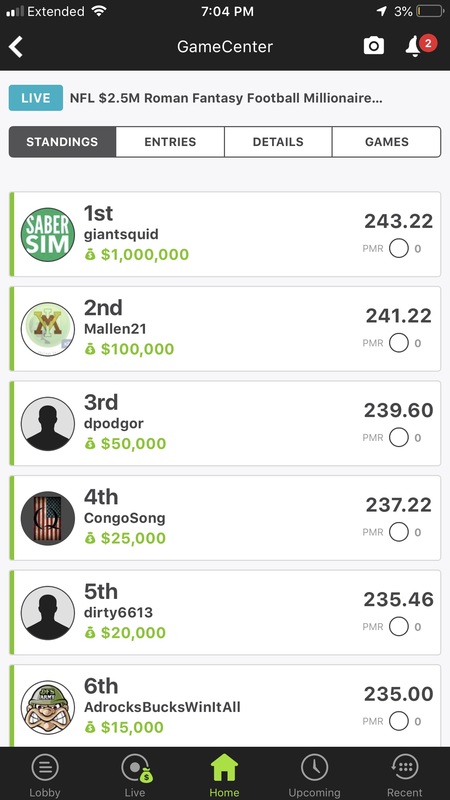 1/20/19: Congratulations to DFS Army Staff Member CashKeg on this 2nd place finish for $10,000 in NBA on Draftkings tonight! 1/20/19: Congratulations to DFS Army VIP Member jshua6 on this $5,500 win on DraftKings this weekend in NFL! 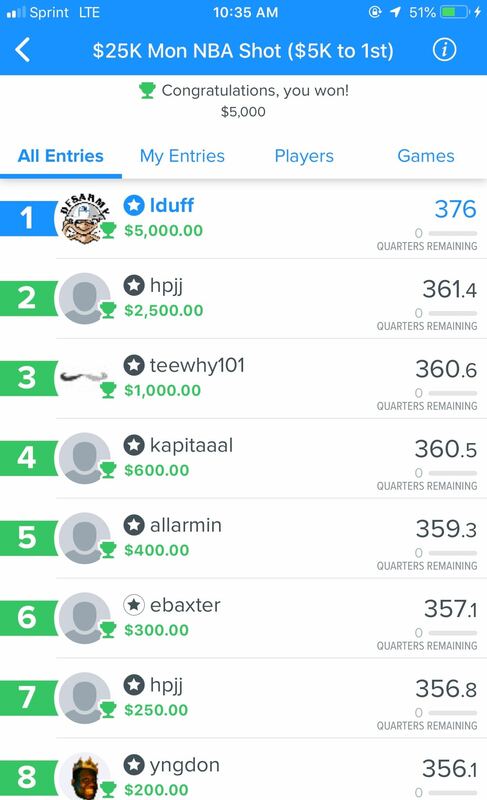 1/14/19: Congratulations to DFS Army VIP Member lduff (lins14 in chat) on taking 1st place in the $25k Mon NBA Shot winning $5,000 on FanDuel! 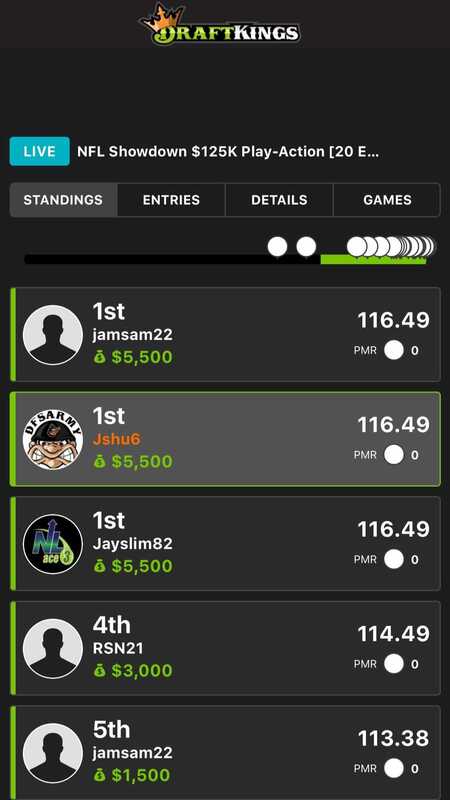 1/9/19: Congratulations to DFS Army VIP Member TeamBruce on this 1st place finish in the NBA Four Point Play on DraftKings winning $12,000! 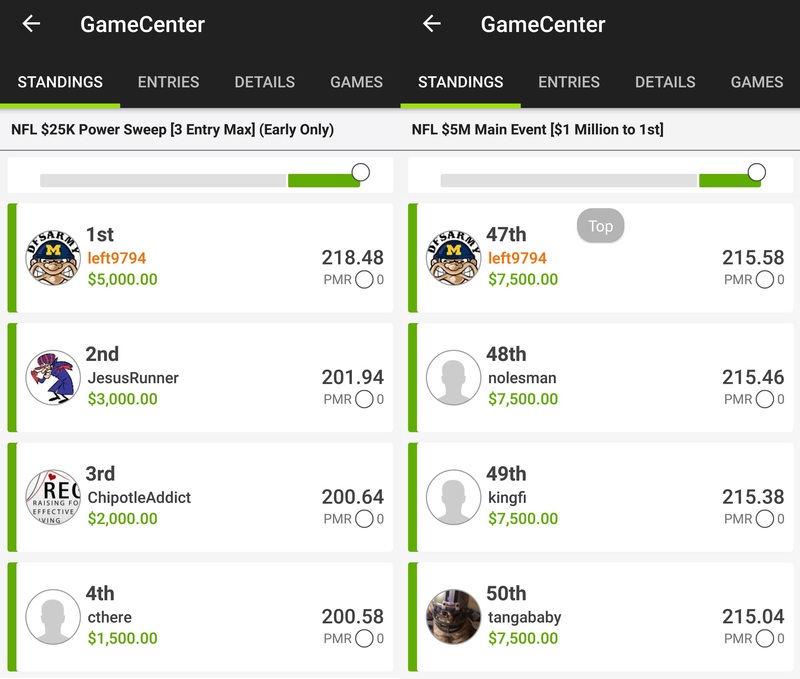 12/30/18: Congratulations to DFS Army Member zonin on this 2nd place finish in the NFL $400K Power Sweep on DraftKings winning $40,000! 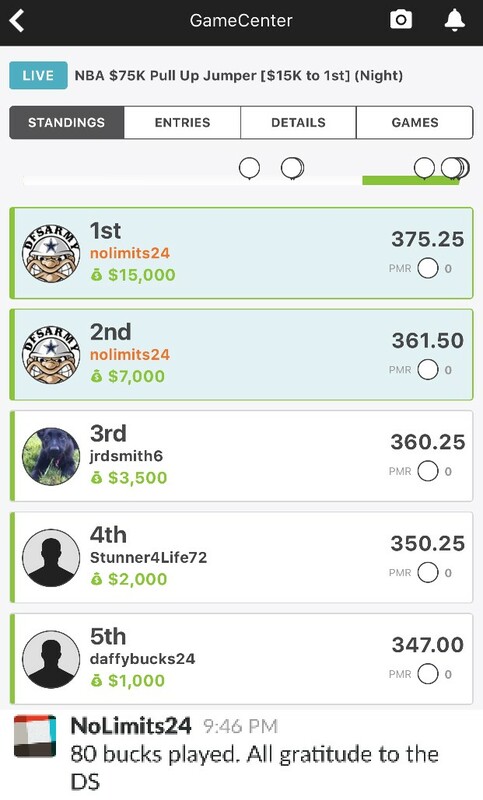 12/30/18: Congratulations to DFS Army Staff Member adrocksbuckswinitall (burns273 in chat) on taking 6th place in the NFL $2.5M Roman Fantasy Football Millionaire Contest on DraftKings today winning $15,000! 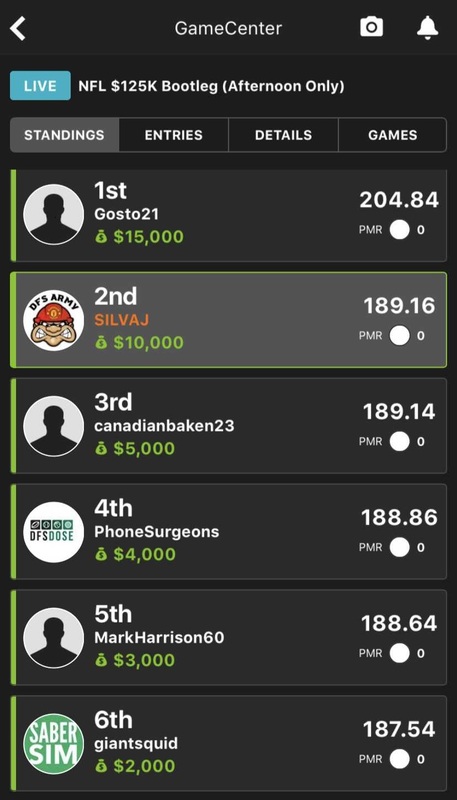 12/30/18: Congrats to DFS Army VIP Member SILVAJ (Pulpo008 in chat) on this 2nd place finish in the NFL $125K Bootleg (Afternoon Only) on DraftKings today winning $10,000! 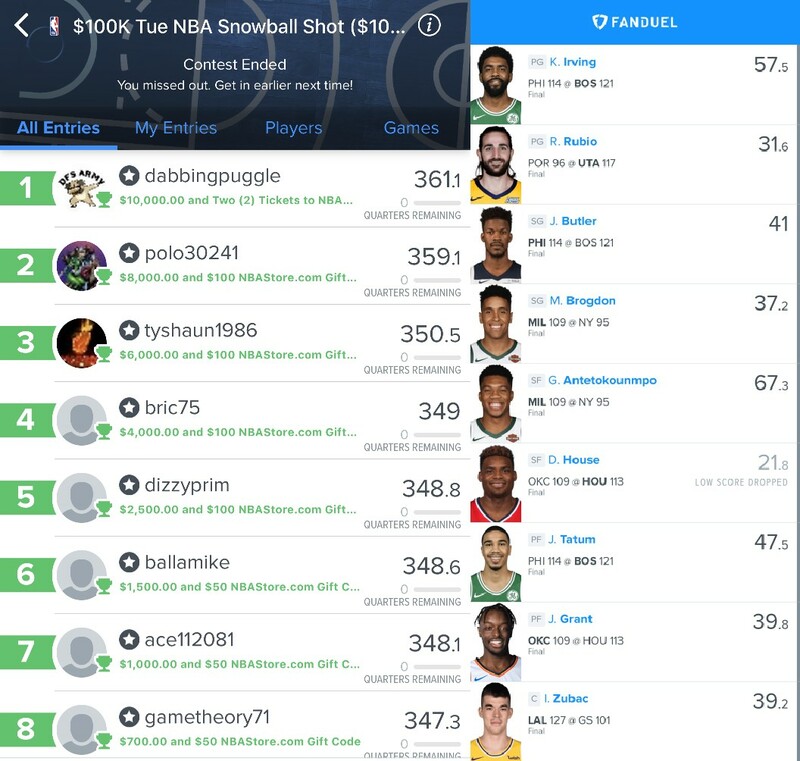 12/25/18: Congratulations to DFS Army staff member dabbingpuggle on this 1st place win on FanDuel in the $100k Tue NBA Snowball Shot winning $10,000 and tickets to an NBA game! 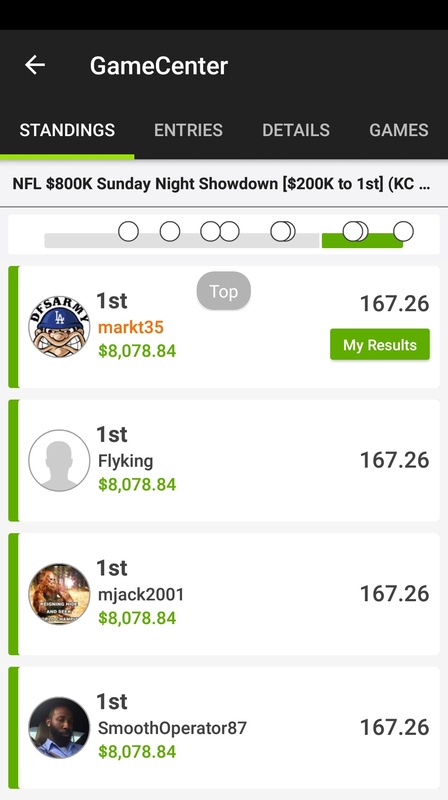 12/23/18: Congratulations to DFS Army VIP Member markt35 (Mark in Chat) on taking down part of 1st place in the NFL $800k Sunday Night Showdown on DraftKings winning $8,078.84! 12/23/18: Congratulations to DFS Army VIP member left9794 who won over $12,500 on DraftKings this weekend in NFL! 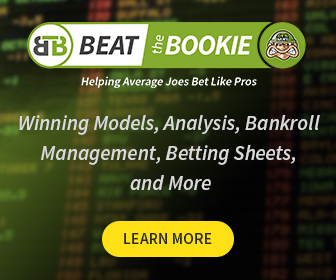 He took down 1st place in the NFL $25k Power Sweep [3 Entry Max] on the Early Slate winning $5,000 and 47th place in the NFL $5M Main Event winning $7,500! 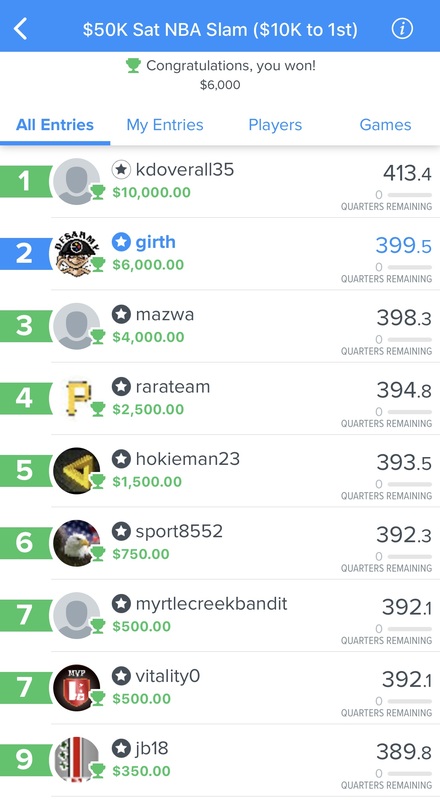 12/22/18: Congratulations to DFS Army VIP Member girth (Randy in chat) on this $6,000 2nd place win in the $50k Sat NBA slam on FanDuel today! 12/19/18: Congratulations to DFS Army VIP Member Sempernaut on another big win! 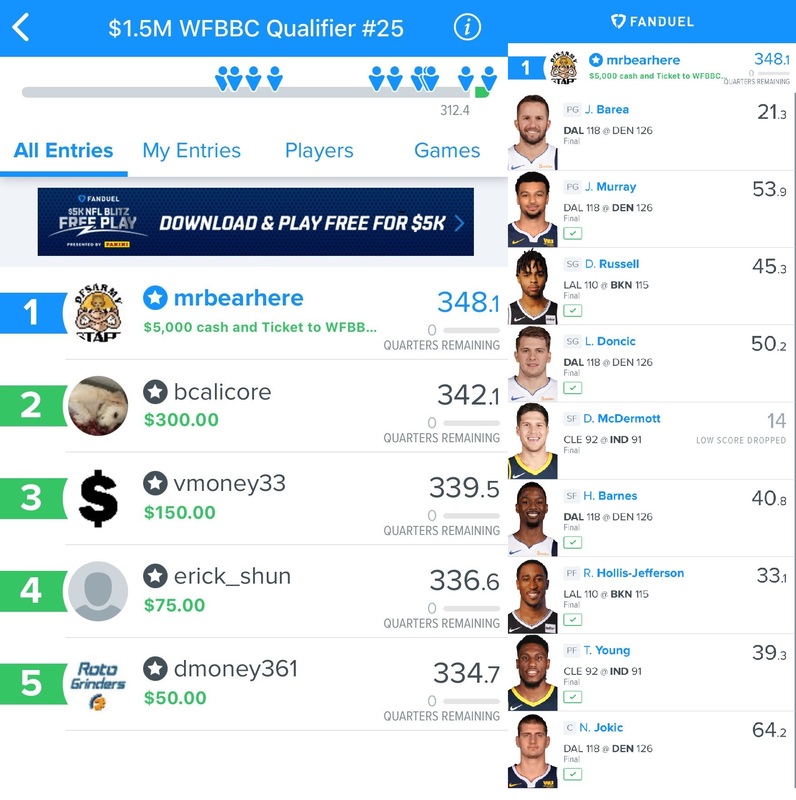 12/18/18: Congratulations to DFS Army Staff Member mrbearhere on winning this qualifier to the FanDuel Live NBA final and $5,000! 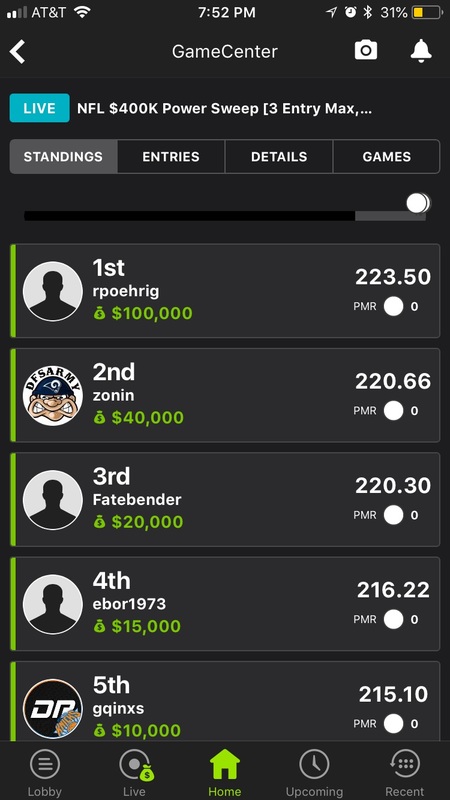 12/17/18: Congratulations to DFS Army VIP member gotem_88 on taking down part of 1st place in the NFL $1M Monday Night Showdown on Draftkings winning $7,173.97! 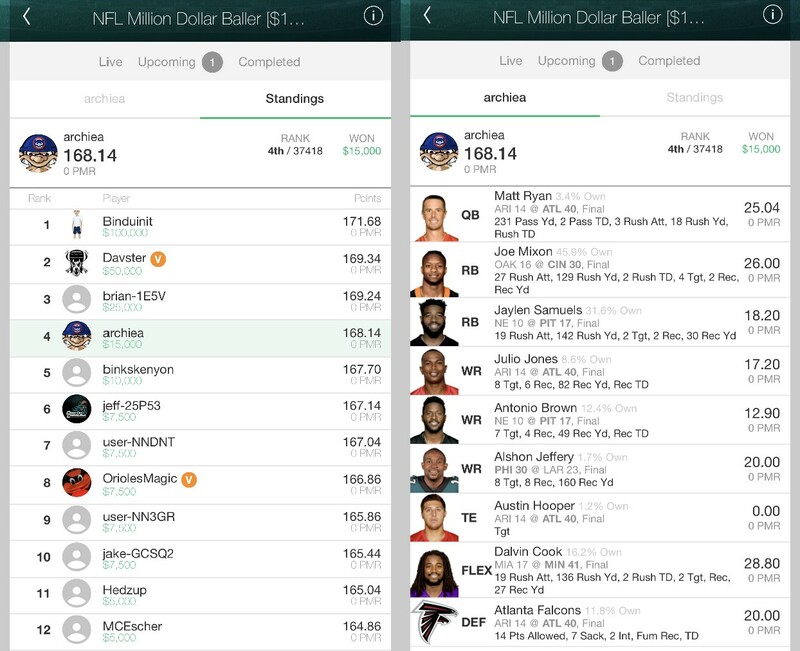 12/16/18: Congratulations to DFS Army Member archiea on taking 4th place for $15,000 in the NFL Million Dollar Baller on Yahoo today! 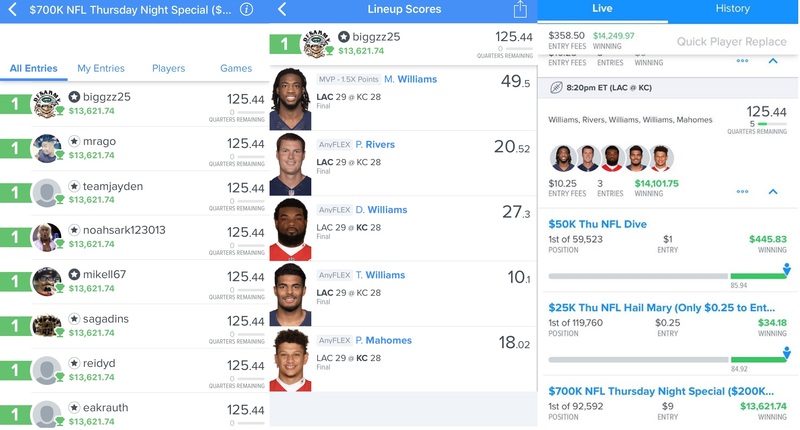 12/14/18: Congratulations to DFS Army VIP Member biggzz25 on this $13,621.75 1st place tie on FanDuel tonight in the $700k NFL Thursday Night Special! 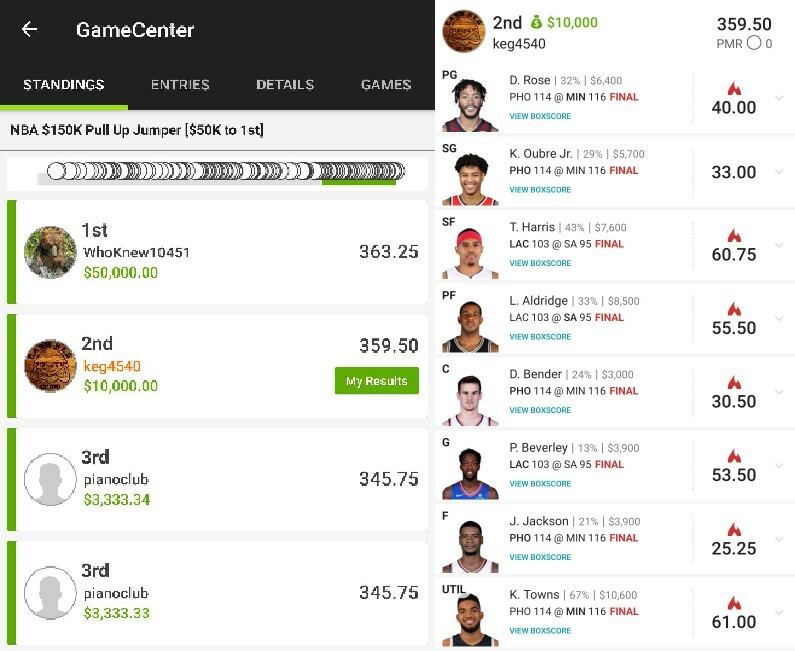 12/5/18: Congratulations to DFS Army VIP Member nolimits24 on this 1st and 2nd place finish for over $22,000 on DraftKings tonight in the NBA $75k Pull Up Jumper! 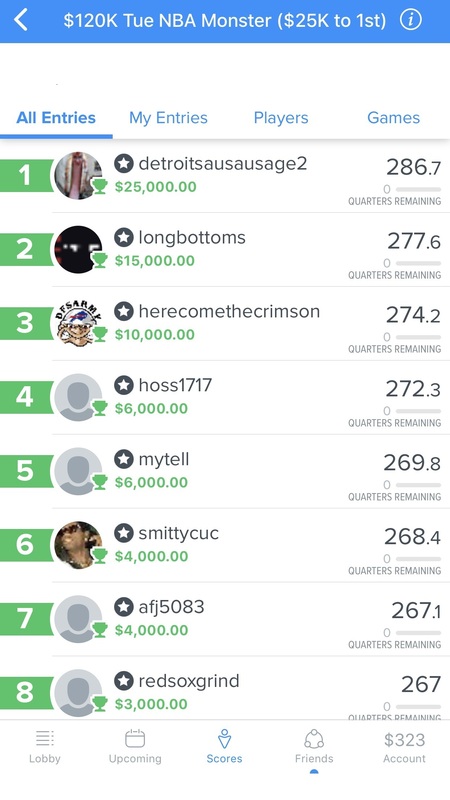 12/4/18: Congratulations to DFS Army VIP Member herecomethecrimson on this 3rd place finish in the $120k Tue NBA Monster on FanDuel winning $10,000! 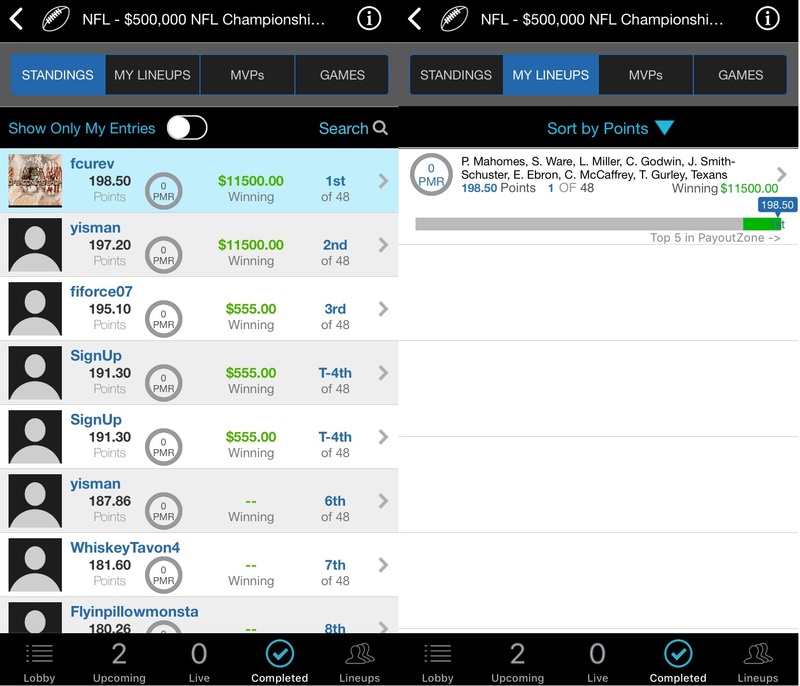 12/3/18: Congratulations to DFS Army Staff Member DFSnDonuts on taking down the NFL – $500,000 NFL Championship Qualifier on Fantasy Draft winning a spot in the final during week 16! 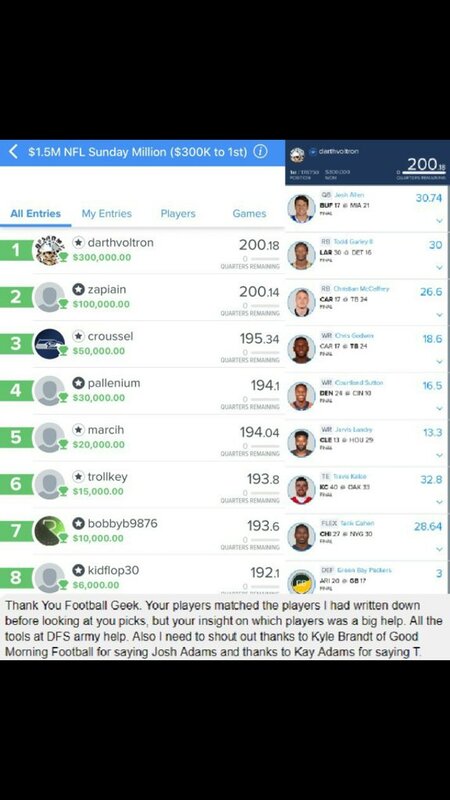 12/2/18: Congratulations to DFS Army VIP Member Darthvoltron on his life-changing win on FanDuel this weekend. He took down 1st place in the $1.5M NFL Sunday Million and won $300,000!